The opening pages of Anderson & Low on the Set of James Bond’s Spectre strike the reader with the sheer beauty of images of vast interior spaces. Jonathan Anderson and Edwin Low are London based photographers who bring an elevated, fine-art aesthetic to their commercial advertising work, be it for companies such as Deutsche Bank, Hewlett Packard, Time Warner, GQ, or the movie stars of Star Wars, The Force Awakens. 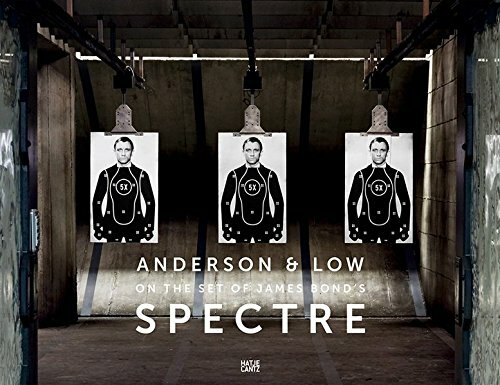 When they were invited by the producers of the James Bond film Spectre to create a special art project, Anderson and Low seized the opportunity and have produced an extraordinary collection of photographs of the Pinewood Studios sets used in making the film. The images are other-worldly, reflecting an artistic point of view that defies assessment of what is “real” and what is not by creating an image of the sets as actual places, harnessed within a fiction but also encompassed in a larger reality. As is typical in a globe-trotting James Bond film, Spectre was shot at a variety of outdoor locations that included Mexico, Rome, Austria, and Morocco, but a great many more scenes were filmed on set at Pinewood Studios. For instance, the room of the L’Americain Hotel (supposedly in Tangier, Morocco), where Bond (Daniel Craig) and Madeleine (Léa Seydoux) spend the night, has the stunning details and all the human touches that establish it as a “real” place until one notices the false ceiling and lighting gear peeking through. The full-scale London bridge where the helicopter crashes for the movie’s dramatic finale as well as the extensive interiors of the old MI-6 building that is destined for demolition are indoor sets of astounding scale. The impeccable construction and attention to detail make the sets totally believable as actual places in the real world while the refined lighting and expertise of Anderson and Low transform artifice into marvelous spaces of aesthetic reflection. Although a slim volume, Anderson & Low on the Set of James Bond’s Spectre will delight its viewers with its large full-page images and the high quality of its full-color printing. The book does not give any insight in the way of technical details as to the specifics of the set dimensions, construction, lighting, or how the photographic images were shot. But the outstanding fine art photography, the luster of the printing, the excellent weight of the paper, and its binding will make this book a rewarding visual feast for any film aficionado. Richard Rivera is a native New Yorker who graduated from the School of Visual Arts in New York City. He has been an artist, designer, and writer in publishing, advertising, film, and illustration for over 30 years. Having begun as a painter his eclectic tastes range from visual arts to graphic novels and comics books to photography. He is also the publisher of Camera-Sense.com. His photographs are in the permanent collection of the Brooklyn Museum of Art. His forthcoming Eagles of New York is a photographic celebration of the eagle in the architecture and sculpture of New York City, the first of a planned series of large-scale art projects in major cities around the world.